Burhart, a resident of Franklin, Tennessee, knew Florida State was the place for him once he visited the university and saw the abundant opportunities and warm campus atmosphere. As an environment and society major, Burhart has taken advantage of FSU’s wide range of programs. He dove into research his freshman year with the help of the Undergraduate Research Opportunity Program (UROP). The program provides first- and second-year students a chance to get hands-on research experience in any field under the guidance of a professor. 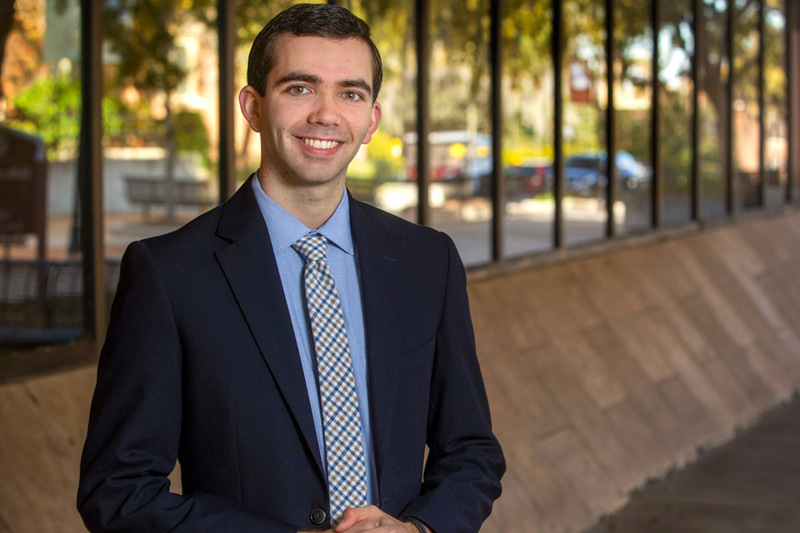 Burhart earned automatic acceptance to UROP because he was a member of FSU’s Presidential Scholars Program — the university’s premier undergraduate merit scholarship program. Its mission is to recruit top students and help them emerge as transformational leaders on campus. Presidential Scholars are encouraged to focus not only on academics but also on broader goals for their college experience. Branching out translated into a fascinating opportunity for Burhart with the National Outdoor Leadership School (NOLS). It’s a wilderness education school headquartered in Lander, Wyoming, with a mission to develop individuals’ leadership and outdoor skills. Florida State provided funding for Burhart to enroll in a backpacking course with NOLS during the summer after his freshman year. As part of the class requirements, he hiked for a month through the North Cascades National Park in Washington. The course proved to be a pivotal experience. Burhart developed new life and leadership skills, discovered academic interests and realized outdoor education was his main career passion. FSU IDEA grants are available to students in all majors and provide funding for original research, creative projects and innovative ideas. The projects last from 8-12 weeks and are supervised by faculty members. Grant winners present their research findings at the President’s Showcase of Undergraduate Research Excellence every fall. Burhart partnered with FSU’s Leadership Learning Research Center on his research project. He worked under the guidance of Kathy Guthrie, associate professor at the College of Education, and former graduate research assistant Vivechkanand Chunoo. The IDEA grant allowed Burhart to travel to Wyoming during the summer of 2018. He talked with NOLS instructors to better understand the outdoor education program. Burhart’s successful research opportunities prompted him to return to UROP in his junior year as a mentor for younger students. He wanted to help them have positive research experiences and learn more about possible careers. “I wanted to come back to teach for UROP to help students find their insatiable curiosity and help them develop self-awareness so they know exactly what they want to devote their time to,” he said. Burhart’s leadership skills have flourished in academic pursuits, as well as his extracurricular activities. Since his freshman year, Burhart has served as a University Ambassador for FSU’s visitor center, giving tours to prospective students and families. In the future, Burhart plans to attend graduate school and continue pursuing his interests in outdoor-leadership education and conservation. He hopes to establish a career in camp administration or wilderness education, designing curriculum and creating opportunities that help students develop academically and personally. Having that kind of impact on others would be most rewarding for Burhart because it’s what he has experienced at FSU as he’s envisioned his future.